Home / Blog / What Exactly Did the Little Lord Jesus Do with His Head? In an important sense it doesn’t matter at all. Because the word following laid/lay starts with a d, there is no discernible difference when it is said or sung aloud. You don’t have to know which word is correct in order to sound right when you sing it. The only problem comes when you have to write it. Since we sing it more than we write it, this is really nothing more than a grammatical exercise. I just think it’s an interesting grammatical exercise. This is how the song first appeared in 1884. How Did the Author Write It? That’s a good question. I meant which is grammatically correct, but certainly we should consider how it was originally written. The problem is, nobody knows how it was originally written! Scholars don’t believe Luther actually wrote it, however, since it was never mentioned and appears nowhere in his writing. The best guess is that someone at The Myrtle wrote it and attributed it to Luther as a marketing gimmick. Since we don’t know who wrote it, we can’t tell whether he or she wrote lay down or laid down. We do know that this first known publication had it lay down. See the image to the right. This was how it appeared the next time–in 1885. 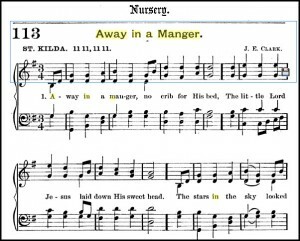 “Away in a Manger” next appeared in print the following year in a Lutheran Sunday School collection titled Little Children’s Book for Schools and Families. This time, however, the verb was lay down instead of laid down. How about today? Well, I did a Google search for “Away in a Manger” and found a nearly even split between sites that have it lay down and sites that have it laid down, with a slight advantage to the latter. The point is, it’s impossible to say with certainty who wrote the original hymn or which verb was originally intended, and there is wide disagreement about which way to print it today. What we’ve got here is a classic example of the ever-baffling lie vs. lay situation. I’ve written about lie vs. lay before, but let’s review. I lay my book on the table. The chicken lays eggs every other Thursday. Ed lays a mile of sewer pipe every week. I feel ill, so I think I’ll lie down. The wounded chicken lies in the barnyard. How long did my wallet lie in the grass? I laid my book on the table. The chicken laid eggs every other Thursday. Ed laid a mile of sewer pipe every week. But the past tense of lie is…wait for it…lay! I felt ill, so I thought I’d lay down. The wounded chicken lay in the barnyard. My wallet lay in the grass a long time. Now, in this hymn, we don’t simply have an option between the verbs lie and lay (that would be too easy). We have a phrasal verb including lie or lay. A phrasal verb is a verb that is composed of a regular verb and a particle — a word that looks like a preposition but doesn’t work like one — in this case, down. Whether or not it’s a phrasal verb doesn’t really matter though. The question is still, Do we need the transitive verb lay down or the intransitive verb lie down? Before we answer that, we need to talk about the tense of the verb. The little Lord Jesus lay/laid down his sweet head. The verbs in the third line are past tense–looked and lay (the past tense of lie). But it is also clearly past tense because the option is between lay and laid, which are both past tense verbs. If the line were in the present tense, since the subject of the verb is the singular Jesus, the option would be between lies and lays. In the present tense, lay down would be incorrect here because it would create an agreement error. So this must be the past tense intransitive verb lay, not the present tense transitive one. There is, of course, another factor confusing people here. 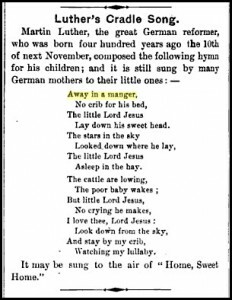 It’s the second stanza of the song: The cattle are lowing, the poor baby wakes/But little Lord Jesus no crying he makes… For some reason the songwriter puts the second verse clearly in the present tense. That confuses many people into assuming the first stanza should be in the present as well. Nope. They are, for some reason, in different tenses. Thanks, Mr. Anonymous Songwriter, for making this song as grammatically difficult as possible. all we need to figure out is if we need the intransitive verb lie down or the transitive verb lay down. And that’s not hard. In this sentence, the verb takes an object — his sweet head, or simply, head. If we put it in the present tense it’s clearer: Jesus doesn’t just lie down. He lays down his sweet head. We would not say Jesus lies down his sweet head, of course. So, now that we’ve settled on the right verb–lay, we must put it in the past tense, which we’ve already learned is laid. 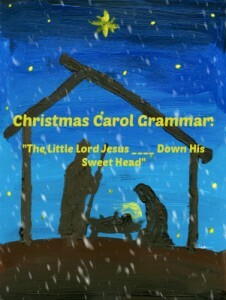 The grammatically and syntactically correct line therefore is: The little Lord Jesus laid down his sweet head. Yay. So what? is a good question. Please don’t assume that my lengthy and meticulous explanation implies that this is an important matter. It is not. It does not bother me in the least that thousands of carolers will be singing lay rather than laid. I am not on a mission to correct anything. I don’t even want to be friends with anyone who thinks this kind of thing matters. I just find it curious. I like solving grammatical puzzles, and I think there is educational benefit to working through issues like this. It teaches us to think correctly about language, and that matters much more than getting the answer right in the end. And this was a particularly challenging puzzle. It has exhausted me. I think I’ll go lay down my sweet head. Please be kind enough to leave any comments or questions in the Reply section below! I would have thought that the word ‘Lay’ would have been used in a more traditional sense, and ‘Laid’ was more modern. I hope that his mother The Virgin Mary, laid him gently in the manger. Being an infant, he would have no control as yet. I appreciate your examples. I now conduct informal English lessons around the world as we travel to do medical assistance. People everywhere are anxious to improve and question their abilities in English, so I find these postings to be great reminders of what makes our language so difficult for others. What an an encouraging comment. Thanks for leaving it, Emil. The journey is much more fascinating that the destination in these grammar discussions. Fascinating history of these verb tenses, Brian! I can finally lay – or it is lie – this issue to rest.